This project wants to make the world a better place. 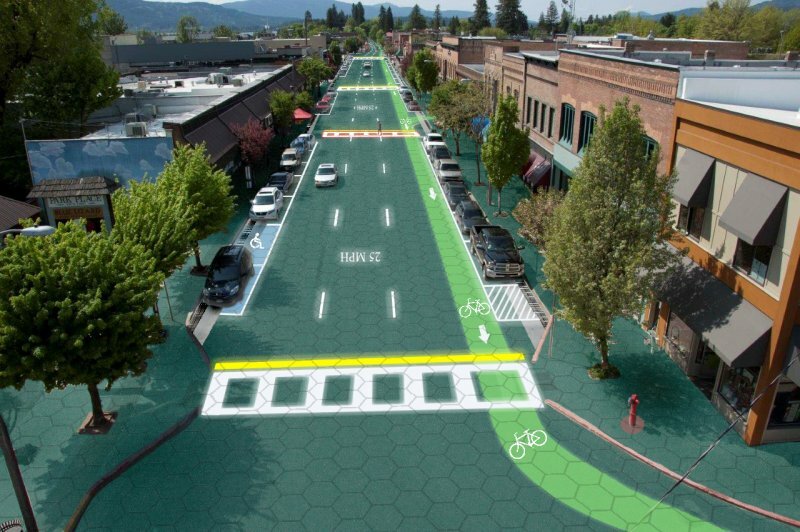 The theory is that we can use our road space as a clever way to harvest energy from the sun and cope better with problems like storm floods. The challenge? This is a very small company that needs $1m to move to the next step. The campaign on Indiegogo, when this post was published, has 19 days left to run and has only raised $90,000. The good news is that although $90,000 is just a tiny fraction of what’s needed the project is on Flexible funding so the inventors will get to keep all pledges. Are you tempted to back the project or do you think it’s a crazy idea? If you’re tempted then you can help fund this project on Indiegogo. A question to wrestle with is whether governments will step up and start to take some serious action. A related question, a scarier question, is how bad will problems become before governments do take action. I’m certain that technology will play a significant role in the future; both as a way into trouble and as a way out of trouble. Sony, a technology leader, are reaching out to bloggers to encourage all of us to think about the future. Each of the scenarios is worthy of a deeper dive. There’s a clip in the FutureScapes video when a woman discusses getting extra credits for – well, the video below goes into the idea of snooping on your neighbours’ energy consumption in more detail. The video is part of Sony’s Open Planet Ideas which we’ve written about before. What do you think of this possible vision of the future? Would you watch and report your neighbours’ energy consumption if it was easy to do so, helped save the planet and earned you money? I’m a fan of The Co-operative but perhaps not for the reasons you think. I know that The Co-operative provide a wonderful service at a time when you need it the most. Did you know they have a funeral care service? You can imagine the situation all too clearly. You’ve just lost a loved one. You’re barely able to think let alone come up with a clever plan to whisk money out of thin air in order to pay for expensive funeral arrangements. Near me there are three local Co-Op Funeralcare providers; one in Musselburgh, one in Prestonpans and one in Tranent. I think the Co-operative is better known for their food, general ethical retailing and forward green thinking. Theyre also very good at reaching out to people and persuading them to get involved. I wanted to put the spotlight on two the more recent efforts from the Co-operative. First there’s Urban Bees and then there’s the Baywind Energy Co-operative. The bee population is in sad decline. This will be bad for all of us. There are a number of theories ranging from lack of biodiversity, infections and even possible leaks suggesting the American EPA allowed bee killing pesticides to be used. We have neither a clear answer nor solution. Urban Bees’ have a cleverly named “Plan Bee” that’s supported by the Co-operative. It’s so simple but it’s effective. Plan Bee involves teaching more city folk how to be beekeepers. The Co-operative’s cash goes towardsh such things as beehives on roof tops. I don’t understand the fuss over wind warms. I don’t get the “not in my back garden” mind set and I don’t think they look ugly. I accept more research into how they might impact important species like bats is necessary but we need to build the farms in the first place in order to benefit from the green energy and do the research. The Co-operative bank supported such a project on Harlock Hill in Cumbria. 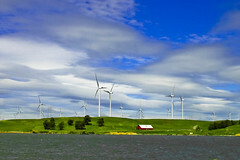 The result is the Baywind Energy Co-operative which now generates about 10,000 Mwh of energy. That’s enough for about 30,000 homes. Where did all start? You have to go back to 1844 and the Rochdale Society of Equitable Pionners. It was these 28 weavers and other craftspeople who created the initial Co-operative. This wasn’t the very first Co-operative attempt, there had been failures before but the pioneers learned from these and put some of those learnings into the the Rochdale Principles which helped guide the group. The merger of the Pioneers with other co-operative groups resulted in what we now call The Co-operative Group. You can still visit the original store in Toad Lane which is now the Rochdale Pioneers Museum. Not bad, huh? Quite a success story and an incredibly early effort on ethical and co-operative retail. Despite the history, I think the best may still be to come so no wonder more people are seeking to join the revolution and get involved? Are their any Co-operative activites in your area? If you’re a fan we’d love to hear about your experiences and recommendations. Are dog houses cruel? I guess it depends where in the world you live. I’m sure some people force their dog to sleep outside when it’s far too cold. Better dog houses would help and why not one heated with geothermal energy? This dog house comes from Miller Pet Products and is made with up to 20% recycled materials. 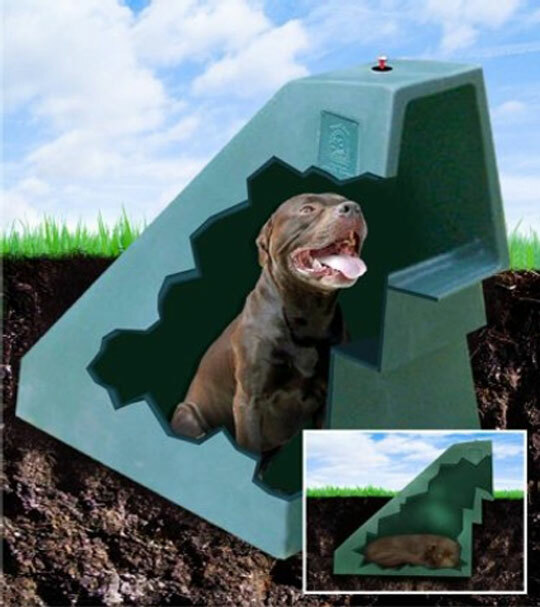 The design of this unique “21st Century Eco-Friendly” underground dog house takes advantage of the Earth’s own natural temperature control system. The indestructible shell is partially buried to create, not only a natural den habitat preferred by dogs, but is also then cooled in the Summer and heated in the Winter, naturally. What do you think? A good idea? Too hard to dig into the garden? Too hard for the poor dog to get in and out of? Or just ideal as a space-saving and warming alternative to the usual dog house? This post should begin with a disclaimer; mathematics and lies are closely related. Clever people can cut figures in accurate ways that give them mathematical support to their argument. In this case we have clever people in the form of The Next Big Future bloggers and their goal is to educate people about new technologies. The headline stats are simple. A calculation on the deaths caused by fuel versus the power generated. What does TWh mean? I take it to be an extension of “KWh” or kilowatt hour and “MWh” or milliwatt hour. Therefore TWh means terawatt hour. Today has some good news for Mother Earth. Google, the search and ads site, has been trying to be carbon neutral since 2007. Today they’ve signed a big deal – a 20-year deal, in fact – on green Power Purchasing. Come July 30th they’ll be buying clean energy from the wind farm at the NextEra Energy Resources Story County II facility. That’s 114 megawatts of clean energy. What Google has wisely done is agreed a 20 year price for that energy. That long purchase means the developer has financial security. They’ll be getting cash from Google for 20 years. That’ll allow the developer to build more clean energy projects. I’m sure Google won’t mind having to wonder what the energy price will be like in 20 years either – although, I very much doubt this windfarm deal covers anything even close to the energy Google consumes all around the world. Google says it’s enough energy to supply several of its data centres. It’s worth noting that Google still buys carbon offsets, trying to account for those emissions they can’t find away to avoid. Carbon offsetting has become far less popular in recent years with companies like Responsible Travel suggesting it doesn’t work. Is this a good, green and clean move from Google? Or do you think there’s a small of PR about this? Can it be both at the same time? Let us know what you think.